Novelist And 'Book Matchmaker' Tayari Jones Shares Her Favorite Books Of 2018 Ahead of the holidays this year, All Things Considered is inviting writers to talk about the books they'll be gifting to friends and family. Jones, author of An American Marriage, shares her list. Ahead of the holidays this year, All Things Considered is inviting writers to talk about the books they'll be gifting to friends and family. Here's the list that Jones, author of An American Marriage, has compiled for her loved ones. "I like an immersive book where you can just commit to it and stay with it for a long time. I was really surprised at how much I loved this book because, you know, it's about trees — I had not put a lot of thought into trees and I think some of the magic of Powers' storytelling is that he really helps you see trees and the Earth as a very urgent matter. ... We have various social issues that are so important to us, but if we don't have an Earth on which to have these issues, you know, all of the rest of our efforts are for nothing." "I basically ate this book while I was on a plane. It is about Circe ... the enchanted goddess. But she's like a low ranking goddess, so the other gods don't really respect her and she has been exiled for sorcery. She has various relationships with all these mortals and I feel like modern women can totally relate to the idea of being a goddess and trying to date all these mortals — it's difficult. It's also about work life balance ... she has lots of responsibilities as a goddess, but she also has a son whom she loves and she has assorted lovers, and she's trying to figure out how to do all these things at once while also pursuing her own destiny and nurturing her own talents — literally her own magic." "A lot of the stories are set in Detroit which is the author's hometown. It's a lot about the everyday challenges of being an African-American mother. The title story — "Meet Behind Mars" — it's all in letters that a mother is writing to her child's school. Her son has been — just throughout his entire childhood career of school — been put in detention for little small infractions, accused of bullying, accused of being a criminal because he had a nail file at school ... Sometimes it's funny, sometimes it's heartbreaking, but all the way through it's just brilliantly illuminating." "This memoir is fantastic. It's a love letter to the strivers ... the Great Migrationers who go from the South to the North in an effort to give their children a better life — the incredible sacrifice. "It's moving, it's informative. This isn't a memoir about compromising our values in order to find common ground. This is about becoming our higher selves to move forward into the future we want for our children." 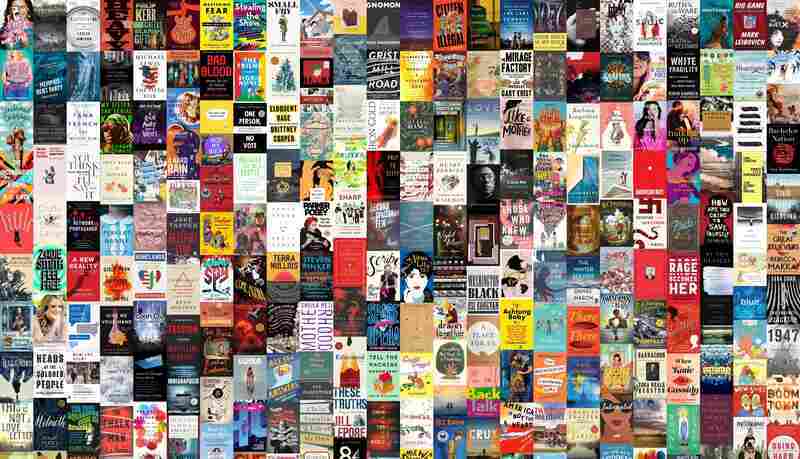 For more reading recommendations, visit the NPR 2018 Book Concierge — more than 300 titles, hand-picked by NPR staff and book critics.